Todoist is one of the world's most popular task management applications. For the last 5 years, it's appeared in hundreds of listicles and thousands of times on social media as one of the better ways to manage your tasks. And Todoist continue to evolve the application as we speak towards becoming the most used task management application. This feature will be a full Todoist review. We will cover features, device, design, pricing and more in this fully explore Todoist showdown. Todoist is a strong, powerful task management software that can be used for small teams, individuals and professionals to manage anything from a shopping list to major projects at work. Todoist can be a simple task manager or solid collaborative tool for teams alike. 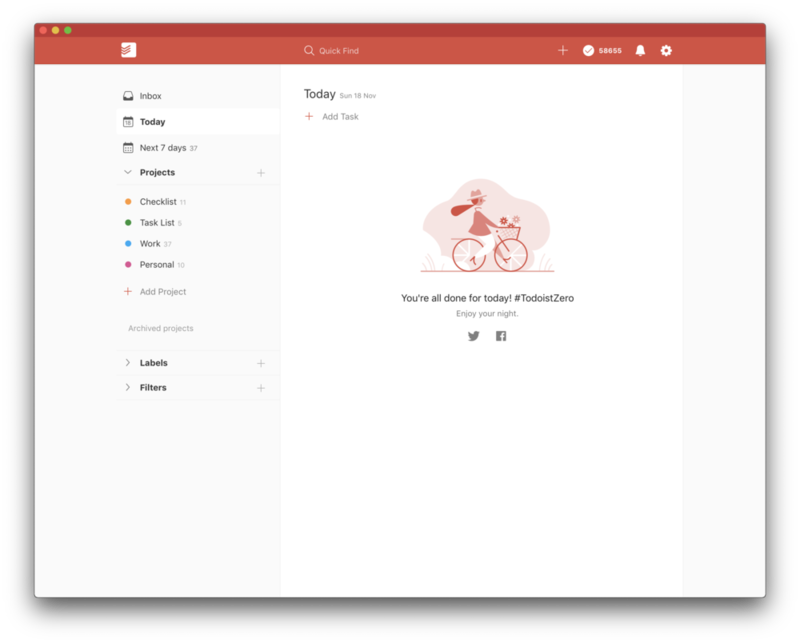 The flexibility of Todoist allows for many users to bring simple set-ups or advanced and more complex task management with ease. Enjoyable for the light user or the more serious of productivity fans. To kick things off, we’re going to give Todoist an official score. Feature set (/20): What features does Todoist offer? Cross-platform (/20): Where is Todoist available to use? Design (/20): How does the design experience feel on Todoist? Everyday use (/20): What is everyday use of Todoist like? Pricing (/20): Value for money on a Todoist subscription? The total score Todoist could achieve was 100. 87/100 is a strong score to achieve making it part of the top 10% of the reviews here on Keep Productive. Calendar - This view will help you plan your week ahead using a calendar panel. Todoist lacks this, whilst applications like Any.DO or TickTick do have calendar views to manage the week or month ahead. Todoist does have a notable integration with Google Calendar. There is a lot of love for Todoist, this is clear. Todoist offers a recurring payment yearly for Premium of $28.99 in the US and £29.99 in the UK. Please note: Todoist pricing is changing as of November 30th, rising to $36.00 per year. You can read more here. Todoist's introduction video is a great outline and introduction to how you can use Todoist for your everyday tasks.